Looking for an aggressive and knowledgeable personal injury attorney? Has a Lawyer . . . Shouldn't You? Is consistently selected through referrals. Personal injury and wrongful death legal cases are complex. You want to protect yourself, your family, your work and your assets plus receive fair compensation for the harm you've received. It takes a very knowledgeable and experienced lawyer with a concentration in personal injury law to manage and resolve the complexities of your specific case. Tom and Ruth Hudson relocated their practice and home to Sarasota and opened The Hudson Law office on September 15, 1996, focusing on personal injury law. Forty-eight percent of new cases at the Hudson Law Office are referrals from other lawyers, and from clients, their friends and family members. 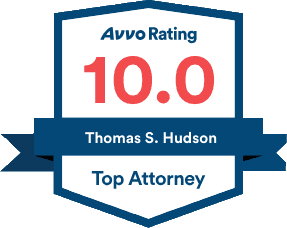 Tom is a licensed attorney in Florida with successful personal injury settlements and verdicts in other areas of the country. Ruth Hudson is the business manager and an Ohio-licensed attorney. Specialized support staff include Lorraine Carriere, Litigation Manager, and Jeanna Johnson, Claims Manager.